Located in the prestigious community of Celebration, this 3 Bedroom, 2.5 bathroom home is near the park at Eastlawn close to schools, shopping, and highways. This is a MUST-BUY! Home prices in Central Florida are stalled out and now is the time to buy! Whether you're buying a home to live in or just as an investment, homes are being foreclosed at a record pace and you get buy Orlando area houses at huge savings! We provide sales and other services for Real Estate in the Central Florida area. Call us today or fill out a contact form and one of our Real Estate experts will assist you with any inquires. Kissimmee, Florida is 20 minutes from all the major Central Florida Attractions and 1 hour away from beaches on both coasts. Kissimmee is the ideal city location for tourists, families, and businesses. Start your Kissimmee Real Estate Search with us! Our internet presence grows stronger every day to reach more consumers. You can use our Kissimmee Real Estate Search tool to look for any properties listed anywhere. New Homes, Resale's, and investment properties are only several clicks away! Real Estate in Kissimmee Florida is a fast growing market. Whether you're in search for a home as a primary residence or searching for investment properties, we will gladly assist you and answer any questions you may have. If you are interested in purchasing a home in Orlando be sure to check our our Orlando Homes For Sale page contact one of our friendly associates. We can help you get all the Details of Houses in Foreclosure in the neighborhood you want! New listings daily. And we'll help you search for the potential equity available in these properties to maximize your investment. 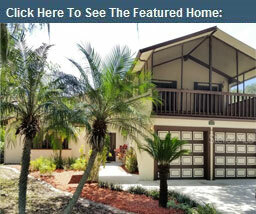 A 4 bedroom 2 bath home with a water view, located in Avalon Park. It has a wonderful split plan with enormous kitchen. This fantastic buy is listed at $179,000! Beautiful 5 bed 3 bath pool house located in desirable Fells Cove. This house is beautifully built with 3800 ft of space! This fantastic buy is listed at $259,900! What an opportunity! Celebration! Victorian Style home with white picket fence nestled on Wisteria Lane. This perfect vacation home is listed at $295,000! Delayed Response Time - Patience is the keyword when dealing with short sales, once you put an offer it may take a while to get a response - during this waiting period it becomes harder and harder to keep track of your order and the waiting also slows you down from making other offers because you are not sure when one will go through or if it even will go through! Price Change - Seeing that the price is subject to bank approval which is not always what the seller lists it for, there is no number that is set in stone. Headache for Both Buyers and Sellers - The short sale process is a very long one, you must be a very patient, persistent person who can keep great records and not fear the risk of being denied by a bank. Another popular option is to pick the times you'd like to vacation here, and rent it out to short term vacationers on the dates it's open. Should you choose this option, the highest demand areas are off of highway 192 in Kissimmee east and west of Disney. The State of Florida has been growing significantly over the past decade. The recent expansion in entertainment has made the Central Florida area a primary attraction for tourists. With so many people moving into the area and realtors trying to make a profit the market finds itself constantly shifting with activity. However, not every home owner or realtor knows the business, and houses are constantly being foreclosed in just about every corner of the state. While this is unfortunate for the owners it is however a blessing for you. With reduced prices and quality properties available you can find exactly what you want at a great price, and most likely in the area you need it! Orlando was recently rated as the “Number one Destination for Vacations,” and for good reason. Since the announcement of the Walt Disney World Resort in 1965 the area has thrived off tourism and attractions. Because the economy in the area is thriving, people tend to come and go, and the real estate in the area is heavily active. However, in the past few years the market has slowly leveled back out, taking a slower pace than the past year. With so many foreclosures in the Orlando area you can find a wide variety of great houses at fantastic affordable prices! Disney is located in the Central Florida area, Orlando to be exact. As the “Number one Destination for Vacations,” the Orlando area has become a prime location to live. However people tend to search for places located as close to Disney as possible, offering them the opportunity to visit the parks whenever they want. However, the closer you get to Disney the more property prices are raised, lucky for you with so many foreclosures in the area these great homes are now at a fantastic and affordable price! In the past the auctions for these foreclosed homes would take place on the steps of the Kissimmee Court House. This tradition carried on until it was later moved to inside the courthouse, where the auction takes place from Monday through Friday. With competitors and realtors at every auction you can view the houses before they go on the market and decide before hand your highest bid. This is a great and fair way to get the houses to buyers, renters and realtors!